It is very rare that you find a deal when purchasing gift cards....but here is one that maybe useful to you? 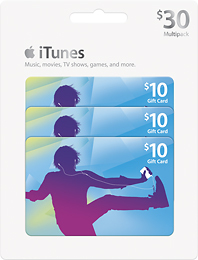 Right now through this coming Saturday Best Buy has a 3 pack of $10 iTunes gift cards for just $25.00. They ship for FREE or you can pick up at your local store if you'd like as well. That's a savings of $5.00. Click here for more details.